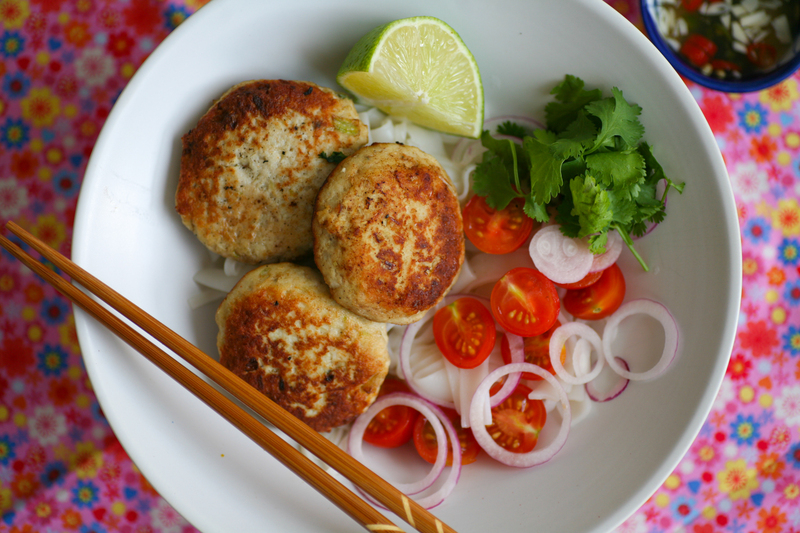 Vietnamese chicken rissoles, or patties if you prefer, are the perfect simple lunch/supper to prepare for all the family. Little Z, who is four, is always a bit unsure about eating chicken, however, disguising chicken as rissoles seems to really work as they are softer and therefore easier to eat than regular chicken pieces. Other than the dipping sauce, there is no chilli in the rissoles, so they really are family friendly. When preparing the rissoles you really want to make sure that the lemongrass and garlic is well chopped up. I chopped them with a knife to begin with before putting them into my spice grinder for a finer texture. The chicken and the shallots also need to be chopped up before whizzing them in a food processor. 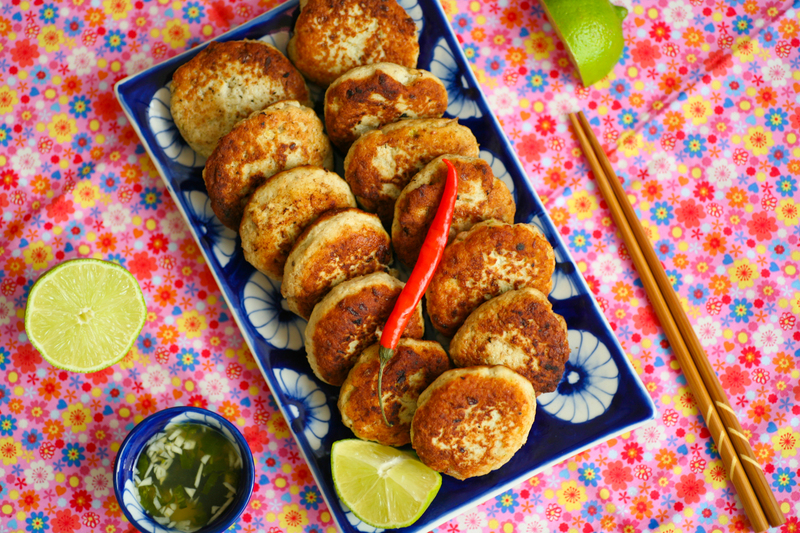 Once the all the ingredients have been combined place some oil into the palms of your hands which will allow you to easily shape your rissoles without them sticking to your hands. Roll them into a ball before flattening them slightly to give a pattie appearance. Cooking time is really short. After heating oil in a pan place five patties in your frying pan and leave them for 3 to 4 minutes before turning them over for a further 3 to 4 minutes. Make sure that the heat is consistent and they do not burn. I like to eat them with a fresh salad of tomatoes, red onions and coriander with splashes of nuoc cham sauce over the top, although my daughters prefer theirs with white rice noodles and splashes of light soy sauce. Any leftovers can be stored easily in the fridge and then enjoyed the following day in a baguette with shredded carrots, cucumber and fresh cucumber – similar to the Vietnamese sandwich – Bahn Mi. More on these glorious sandwiches another time. 1. Finely chop the lemongrass and garlic, initially by hand and then in a spice grinder/blender./mortar and pestle. You want the lemongrass especially to be as fine as possible. 2. After roughly chopping the chicken and shallots place them in a blender until a chicken paste forms. Add the finely chopped lemongrass and garlic and pulse once again. Transfer to a large bowl. 3. Add the eggs, flour, spices and all the other ingredients. Mix well with your hands. 4. Place a little oil in the palm of your hands and then roll some of the chicken paste into your hands to create a ball and then gently press down to create the flattened rissole. 5. Heat a large frying pan with oil and when it is hot gently lower the rissoles into the pan. I usually do mine in batches of 5. 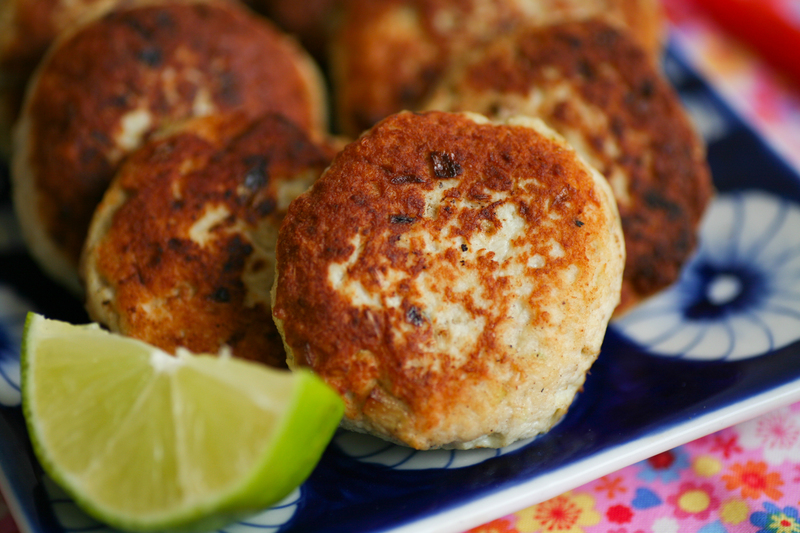 Leave the rissoles to cook well on one side (3 to 4 minutes should be sufficient) before turning over and cooking for a further 3 to 4 minutes. 6. When they have browned, place the rissoles onto some kitchen paper to cool. 1. Initially mix the lime juice with the sugar thoroughly before adding the rest of the ingredients. Continue to mix together. This sauce can be made ahead of time and can store easily. This entry was posted in Chicken and tagged banana shallots, chicken, chicken rissoles, dipping sauce, garlic, lemongrass, limes, nuoc cham, shallots, Vietnam, Vietnamese food. Bookmark the permalink. This sounds delicious and one I will duplicate. In fact, I have all those ingredients on hand. Those sound (and look) so delicious! Definitely going to try this out myself, they look delicious! 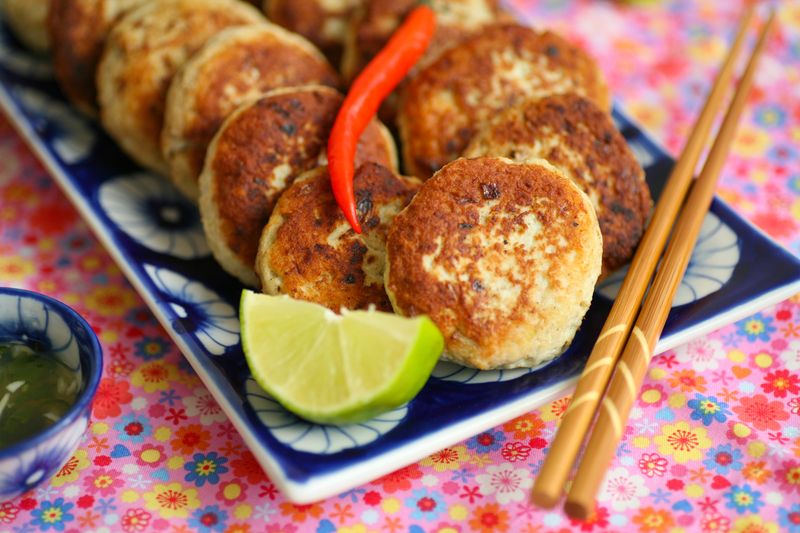 Do you happen to know the Vietnamese name for the Rissoles? Lemongrass just makes anything fresh, and I love that you’ve added it. Perfect combination. These sound and look fantastic. Do you think I could use already ground chicken as opposed to chopping and blending the chicken myself?